New downloadable game from The Sims! Now you can add a super-cute MySims bobbler to your Facebook page. Just click the link and follow the directions. The next Expansion Pack - The Sims 2 FreeTime has been announced! Get The Sims On Stage Karaoke Gadget! Add The SimsOnStage.com Top Karaoke Gadget to your iGoogle page! Join us for our producer chat event Friday November 30th at 2:30PM PST with the SimCity Societies game team! We talked with ultra-modern content creator Simcredible to get some insight into custom content creation. Come check it out! Get this new car download for your game! 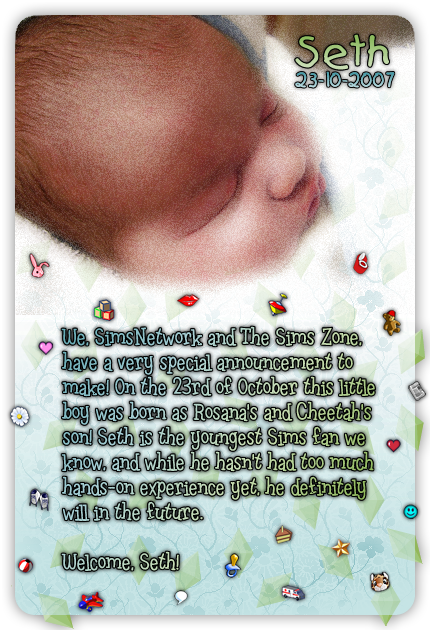 We, SimsNetwork and The Sims Zone, have a very special announcement to make! On the 23rd of October this little boy was born as Rosana's and ChEeTaH's son! Seth is the youngest Sims fan we know, and while he hasn't had too much hands-on experience yet, he definitely will in the future. Welcome, Seth! Find out who won the Teen Style Movie Mashup Contest! Check out the winning video! Teen Style Stuff Available Now! The Sims 2 Teen Style Stuff is in stores now. We have posted new screenshots so you can check out all the cool new items in action! Like my work? Visit my Etsy shop! Forum is currently offline due to maintenance. Welcome to my Mid-Century Modern House theme by Rosana Kooymans.